Complex and evolving structures, often in fluid states, play a crucial role in many industrial processes and commercial products for the pharmaceutical, consumer product, plastic, composite, and petrochemical industries. Selecting and combining the right ingredients in the right manner to obtain optimal properties is essential for success given the inherent challenges and a competitive market. Schrödinger’s Materials suite offers unsurpassed capabilities, in terms of speed, quality, ease-of-use and validated workflows along with expert support to enable researchers to focus on the problem at hand. Workflows are available for determining elastic constants (bulk modulus, shear modulus, etc. ), glass transition temperatures (Tg), diffusion constants, melting points, water adsorption and solubility parameters. These are complemented by powerful simulation tools using atomistic, coarse-grained (including Martini models) or DPD models to permit the characterization of molecular interactions and nanoscale structuring, sometimes within otherwise disordered bulk systems. Such information is usually impractical to obtain from experiment. These characteristics are crucial for structure-based product development and augment the information available from experiment, leading to more efficient and optimized outcomes. 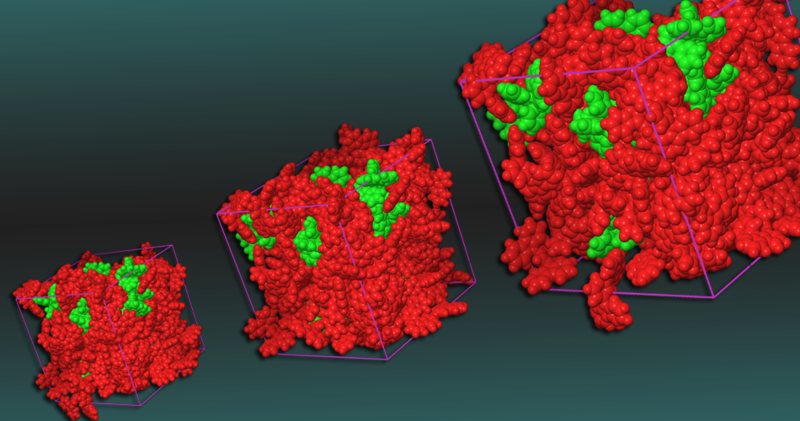 Coarse-grained simulations show (left) that molecules of an anti-cancer drug (represented by red, dark green, grey sites) spontaneously embed into the interior leaflet of the lipid bilayer of a liposome (represented with blue, cyan and light green sites). A central site in the drug molecules packs closely into well-ordered structures resembling crystal nuclei (right). The exponential growth of data, both from experiments and scientific simulation, together with the resounding success of a data-driven approach in many domains, has pushed informatics and machine learning into the forefront for advanced materials research and development. Atomistic simulation furnished by Schrödinger’s Materials Science Suite (MSS) couples with the industry-leading materials discovery and design platform, LiveDesign, to provide the most comprehensive enterprise informatics solution; as an all-in-one, web-based, collaborative, easy-to-use platform. In addition, with its flexible API, LiveDesign can be customized for specific materials applications. In this webinar, we will give an overview of the base LiveDesign platform functionality, and then use the microelectronics R&D process as an example of how LiveDesign, in combination with Schrödinger’s cutting-edge machine learning technology and advanced atomic-level scientific simulation, can provide an innovative platform for semiconductor device, experiment and materials design, as well as data storage, analysis and management. Join us for an overview of high-throughput ligand evaluation and results analysis using Schrödinger's tools. Beginning with preparing your structures for molecular modeling, we will go through structure and ligand-based methods of virtual screening to quickly triage large libraries into a workable number of hits. We will then use Maestro to visualize our structures, analyze our results, and prepare images for publication. At the end of this seminar, you will have a virtual screening workflow that you can apply to your research project. The pKa prediciton program Jaguar pKa has long been useful in cases where the molecule possesses a single protonation site and where tautomeric equilibria may be neglected. When these conditions are not met the use of the DFT-based Jaguar pKa, as well as semi-empirical pKa predictors, becomes problematic. Confusion over the interpretation of results (in case of multiple protonation/deprotonation sites) is common and large errors (in case of acting on a wrong tautomer or protonation state) often ensue. To overcome these problems, we have developed a new generation of pKa prediction methods, dubbed collectively as Macro-pKa. The Macro-pKa methods take care of the multiple protonation channels by automatically generating all reasonable tautomers, computing all the necessary micro-pKa's, and putting them into a single macro-pKa which is directly comparable to experiment. Previously we have been applying Macro-pKa to small fragments and heterocycles with success. However, realistic drug-like molecules often possess multiple rotatable bonds, which complicates the energy landscape and results in the posibility of creating intramolecular hydrogen bonds. The latter may derail pKa calculations and produce large errors, since conformations with intramolecular hydrogen bonds are often artifacts of the implicit solvent model and are unphysical. In this webinar we will trace our progress in the pKa prediction from small molecules to large, flexible, tautomerism-rich molecules capable of forming intramolecular hydrogen bonds. The presentation will prominently feature a recent addition of molecular dynamics with explicit solvent molecules to our Macro-pKa workflow, which addresses the problem of collapsed conformations.